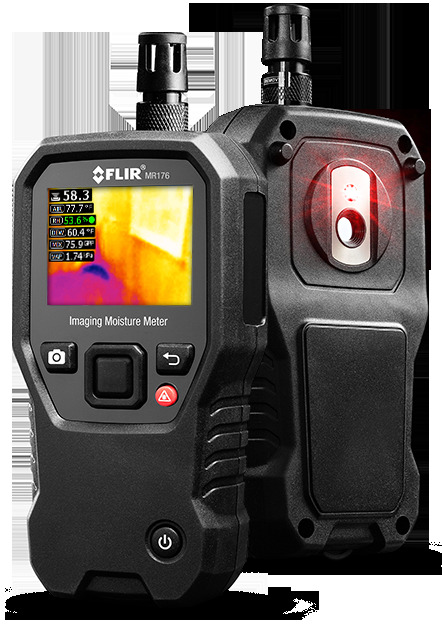 Description: Featuring Infrared Guided Measurement (IGM) technology powered by a built-in FLIR Lepton® 80 x 60 thermal imaging sensor, the MR176 visually guides you to the precise spot that moisture may be hiding. Use the integrated laser and crosshair to help pinpoint the surface location of the issue found with IGM. An integrated pinless sensor and an external pin probe provide the flexibility to take either non-intrusive or intrusive measurements. A field-replaceable temperature and relative humidity sensor delivers added convenience.